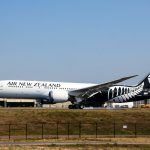 Air New Zealand flight #NZ80 from Hong Kong to Auckland diverted to Cairns International Airport after a male passenger died on-board. The Boeing 787-9 Dreamliner (reg. NZ-NZQ) landed at 02.30 local time. At the beginning, no ground crew were available to assist in the removal of the body at that time of the night. The pilot of the aircraft didn’t want ground workers to use an aerobridge for passengers to risk seeing the deceased body.